"The Kinglsey graduate is a very confident student, who can move on to just about any middle school in the Boston area, or beyond. They know that teachers are approachable, they know who they are as learners, they know where their strengths lie, and they know those areas where they have to continue to work." 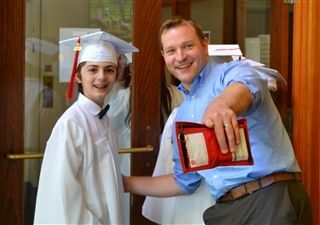 Each graduating Sixth Grade student has a Mentor. The Mentors are selected from our highly qualified group of staff. The purpose of this program is to better share the many talents and experiences of Kingsley staff members as well as to provide our students with additional experiences to get to know themselves and to provide additional support in preparation for the middle and high school experiences on their horizon. We want to help students have a successful Sixth Grade year at Kingsley. Mentors try to get to know the “whole child” through contact with the child, his/her parents, and the teachers. Mentors work together with classroom teachers to make sure that the “team” around the student is working together to facilitate the student’s development in areas such as organization, problem-solving, learning skills, and understanding themselves better. Some families choose a next school based on the quality of the middle-school experience only, knowing they will switch again for high school. Others choose a next school for the entire Seventh through Twelfth Grade experience. We strongly urge families to remember how quickly young people grow and change during adolescence and to consider school options that allow for increasing levels of challenge and opportunities for wider exploration. Kingsley loves to reconnect with our graduates, and learn more about their new adventures. We strive to identify the aspects of a Kingsley education that have been indispensible to our alumni's growth, and learn from their feedback on all aspects of their experience at Kingsley, and thereafter. Find out more about Kingsley's alumni, in their own words, with the Alumni Spotlight Blog Series! Most independent schools and exam schools require students to take one of these two widely used standardized tests. Kingsley provides practice with these tests during the Sixth Grade year so that every student is well-prepared.